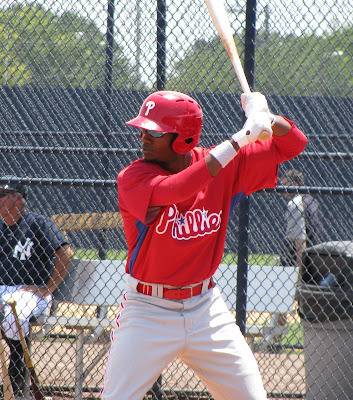 Outfielder Domonic Brown has been playing with the Phillies' extended spring training team in Clearwater, FL since Monday. In his debut there, Brown posted 2 hits in 3 at bats. In the games that followed, Brown merely reached base via a free pass, but he has steadily been hitting the ball hard and appears to be making progress. Brown was sidelined in early March with a fractured hook of the hamate bone in his right hand that required surgery and kept him out of action for six weeks. The 6-foot-5-inch, 200-pound Brown struggled in spring training, starting out on a 0-for-15 skid before recording his first hit in the same game that he suffered the injury to his hand. Brown reported to spring training more than a month early and had adjusted his batting stance, lowering his hands. However, as can be seen in the above image, taken earlier this week, Brown is back to his old ways, with his hands positioned at cranium level. Asked how his heeling hand feels, Brown stated, "Great, better than I thought it would. My first at bat (Monday) I hit an inside pitch up near the handle and I felt a little twinge but it was nothing more than the normal feeling of taking one off the handle. It feels really good." Word from within the Philadelphia organization seems to imply that Brown could be assigned to a full season minor league club, on a rehab assignment, sometime next week. Brown himself indicated on Friday that he expects to initially be activated for the High A level Clearwater Threshers. **Update- Brown batted second or third in each inning of Friday's extended spring training game for the Phillies. In the contest, Brown reached base on an infield single, a high chopper to the pitcher that Brown beat out. Brown also walked and reached base three more times on base hits. In separate innings, he stole 2nd base and third base. PhoulBallz.com correspondent Joe Wombough contributed to this post. It makes sense that Brown would go to Clearwater. He's good friends with guys like Jiwan James and Singleton, so he'd fit right in with that clubhouse.